Our Team - Cypress Creek Animal Hospital, P.C. Dr Henry graduated from Pleasanton High School in 1981. He earned his Doctor of Veterinary Medicine Degree from Texas A&M in 1988. Dr Henry was part of a mixed animal practice in Canton,TX for one year and then in Jourdanton until 1998. Following a brief time in a small animal practice in Ponder, TX he purchased Cypress Creek Animal Hospital in October 1999. Dr Henry is married to Talie and has three children named Mallory, Kade, and Faith. He enjoys golf, fly fishing and gardening. Dr Henry is one of only nine members of the Texas State Board of Veterinary Medical Examiners, all appointed by the governor. Dr. Harrison joined Cypress Creek Animal Hospital in October of 2018. She currently resides in Wimberley; was born in Portales, New Mexico and raised in Hobbs, New Mexico. 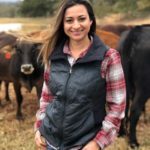 She has a Bachelor’s of Science Degree in Animal Science from Lubbock Christian University, and BVet Med from Royal Veterinary College in London, United Kingdom. 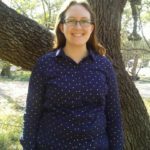 She likes reading and developed a love for traveling while in the U.K. Dr. Harrison also loves exploring Central Texas. Tish has been employed at Cypress Creek Animal Hospital since 2005. She lives in Wimberley with her husband Bob and two sons Ian and Seth. She has 2 dogs Neo and Princess Gypsy Rose; she also has three cats Snickers, Manson, and Bundy. She enjoys reminiscing out with friends during her time off from the clinic and attending her son’s sports events. 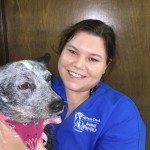 Heather has been with Cypress Creek Animal Hospital since the summer of 2014. She began as a Veterinary Technician, and has recently moved to Reception. She enjoys spending time with her husband and pets, reading, and the outdoors. She has 3 pets; WAG Dog Twiggy, Little Dog and one cat, Fenny. 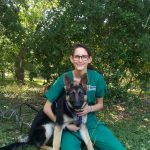 Heather has been with Cypress Creek Animal Hospital since the summer of 2016. With two Heather’s at CCAH, everyone calls her “Woody”. She was born in Tucson, Arizona and currently lives in San Marcos, TX. 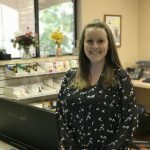 Heather has attended Penn Foster for Veterinary Assistant Program, graduation 2016, and is currently working on her Bachelor’s in Business Management with the same university. She is married to Christopher and has 2 children, Oliver and Melody. Heather has a pitbull named Booby. She likes to spend her free time watching Netflix, drinking coffee, and going on adventures with family. 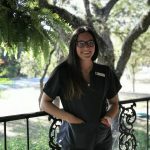 Lawren moved to Wimberley from Houston 7 years ago, and has been with Cypress Creek Animal Hospital since summer of 2014. She was born in Austin, TX. Lawren has a degree in Veterinary Technology from Sanford Brown College. Lawren has 2 German Shepards, Madchen and Rollo, a cat named Big Momma and a python Nagini. She also has a history of working with horses and cattle. Lawren likes paddleboarding, gardening, reading and writing in her spare time. 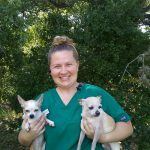 Liz is a Certified Veterinary Technician, she has been with Cypress Creek Animal Hospital since the summer of 2015. Liz resides in Canyon Lake. She has 3 pets; Sweet Pea, Ginnie and Nox, whom she adopted. Liz enjoys reading, hanging out with her friends and training her dog Nox. Ali is currently studying Pre-Vet at Texas State University. She was born in Espanola, New Mexico and raised in Blanco, Texas. Ali holds a Bachelor’s in Marketing with Minor in Management from Le Tourneau University. Her hobbies are cooking, playing with her pets, working and school. She has 3 dogs named Rexi, Koda and Alamo and one kitten. Ali’s motto….”Anything worth achieving is worth the effort”. 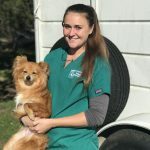 Meggi has been with Cypress Creek Animal Hospital for 5 years. She was born in Austin,TX and resides there with her Pomeranian mix Finnius. Her hobbies are paddleboarding, working out, and taking her dog to the river. Meggi’s motto is…if what you are looking for is buried, just keep digging. Rachael is a licensed veterinary technician. She was part of the CCAH family beginning in 2007, left and returned in December 2017 after receiving her AAS in Veterinary Technology from Portland Community College; graduation June 2017. Rachael also holds a BA in Communications Studies with a minor in Veterinary Science. She lives in Canyon Lake, and was born in Sammamish, WA. Rachel has 6 pets; 2 pit bulls Boondock and Zeus, 2 chihuahuas Vinnie and Bella, 2 miniature pinschers Xander and Violet. She enjoys spending time outdoors with friends and family, floating the river, traveling and reading. 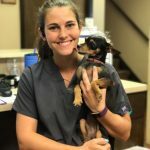 Keegan joined Cypress Creek Animal Hospital in the summer of 2018. She grew up in Bellevue, Washington and currently resides in San Marcos, Texas with her 2 dogs; Dudley and Nash. She has a degree in Animal Sciences and enjoys Netflix and eating snacks.